On a freezing winter morning, the last thing you need is the additional stress of a cold engine that must idle and warm up before you can drive to work. Furthermore, an idling engine often does more harm than good, creating carbon monoxide accumulations too close for comfort. This is where garage heaters come in, offering an endless amount of benefits to your home. As the area’s leading provider of HVAC services, at Jackson Hardware Heating & Air Conditioning, we offer sophisticated garage heaters and garage heater installation to Jackson as well as Washington and Ozaukee county. Whether your garage is utilized simply as a parking spot for your car, a workstation for your DIY projects or a daytime “home” for your pets, a garage heater renders the space safe for families, pets and vehicles alike during the winter months. Need a Garage Heater Installed? Whether you have questions about garage heater installation costs or general heating options for your garage, no matter what time of day or night, you will always speak with a live person when you call us. For priority service or emergencies, you can reach us by calling (262) 677-3477. We are available 24/7. Available in multiple sizes, garage heaters feature a low-profile design with a wide range of capacities for garages of every size and application. They eliminate the adverse effects of cold engine starts, which can help your vehicle’s lifespan, fuel economy and reliability, while preventing dangerous carbon monoxide emissions. A garage heater is also more reliable than a portable space heater, offering the ideal level of warmth, comfort and safety while you are away from home. What Type of Heater is Best for a Garage? Selecting the best garage heater has never been easier with our team of licensed and experienced service technicians. Our complete range of Lennox garage heater products feature the maximum heat capacity of 75,000 BTU, offering cost-efficient solutions for garages and work spaces. 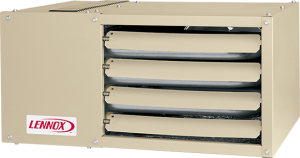 In addition, we have the unique T-Class™ TUA separated combustion heaters available for spaces that are difficult to heat due to excessive humidity, dirt, dust and/or negative pressure. Low-maintenance and highly versatile garage heaters make the perfect addition to any home. Our team is dedicated to helping you keep your garage safe and comfortable even on the coldest days of the year! Why expose your car, family and pets to the dangers of a cold garage when a reliable solution is only one call away? If you would like to learn more about garage heater options in Jackson, WI, or nearby areas, please do not hesitate to contact us at Jackson Hardware Heating & Air Conditioning today by calling (262) 677-3477.